any way to make more use of space?/improve drawing distance? hi i was wondering if there were more ways to improve the use of textures & texture sizes, for example loading textures from fat? the vram is 512mb correct? also i was wondering about improving drawing distance, like for instance. look at DS craft by this person the drawing distance seems alot better, & the skymap. the drawing distance stoppes then you juse see black above that lol. & heres a link to the main site. VRAM is 512KB for the main banks, and an additional 144KB for the secondary banks. 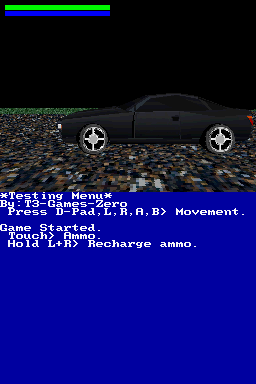 Using 15-bit textures for everything can lead to little availability of the main VRAM. If you are able to consolidate your textures to be palette-based, you can increase the number of textures and/or increase the size of them, as the palettes get stored in the secondary banks. If you were to have textures that were paletted, you could use up to 96KB of secondary VRAM space for them. At 8-bit (256 colors) per palette, that would be up to 192 unique palettes. You can further reduce the VRAM requirement for textures that can be converted to 4-bit (16 colors) or even 2-bit (4 colors) if you really need to. I'm not sure what straight resisters are, but what values are you using for your near/far clipping plane? I assume you are using glPerspectivef32 (or an equivalent) to set up your projection matrix. Also understand that having a far drawing distance can lead to the polygon limit being reached much easier. When you get to that point, you'll have to decide how to proceed, whether to include fog, or even using the capture unit for rendering one part in one frame, and adding that to the next part(s) in following frames. heres the quote of what he said. My game uses "straight devkitpro", no library other than libnds, libfat etc. Actually, I don't really use libnds's features all that much, for most of my stuff I work with registers directly; I also have my own framework to handle textures and other things. What he means about "straight registers" is by directly accessing the control registers and not accessing them through the libnds API. mtheall wrote: What he means about "straight registers" is by directly accessing the control registers and not accessing them through the libnds API. Misspelling can lead to confusion, which is why I didn't know what he meant by "resisters" when he meant "registers". sorry aboth that, it wouldnt let me edit the post for some reason. & yes i meant registers. Accessing registers directly isn't going to help you much, in general. Practically, you only really get to use 256KB of texture memory (slot 0 and slot 1) for general purpose. The other 256KB available is dedicated to the rear-plane image (128KB for the bitmap data (slot 2) and 128KB for the depth data (slot 3)). 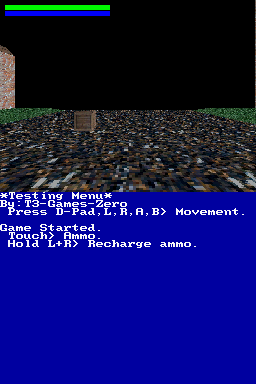 256KB does not give much room for 16bpp textures. You get what? Room for 128K pixels (256x512 area, or 32 64x64 textures, for examples). Of course, it's much more practical to use paletted textures. You can use up to a hefty 96KB to store your palette data. The variety is very versatile. You can use 2bpp, 4bpp, and 8bpp palettes, in addition to a few other formats. At 2bpp, this means you can have a nice 1M pixels of texture data, but it's more likely you'll want 4bpp or 8bpp textures. Not to mention you can do some cool palette swapping tricks to get more out of it (another significant advantage of using paletted graphics). Hardly anyone uses the depth image and even fewer people use the back plane image. Those will be available for textures in almost all cases. Dedicated is a poor choice of words.